On this day in 1955, the Queen Mary received word that two Greek seamen on the Panamanian freighter, S.S. Liberator, had been gravely injured and required urgent medical assistance. 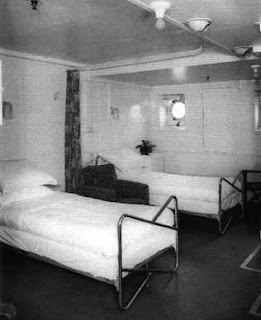 Dr. Joseph B. Maguire was the ship's principal medical officer at the time. In his words, "It was... a race against death... between them [they] had two concussions, one suspected skull fracture, a broken knee, two broken wrists, a broken shoulder-blade, a spinal injury and multiple bruises and lacerations. They had fallen through a hatch." 16:45 hours, in dead reckoning?? Lat. 48 degrees 33' N, Long 27 degrees 07' W % 077 degrees in order to rendezvous with S.S. "Liberator"
The ship traveled throughout the night, rushing toward the freighter, which had no morphine and no stretchers. A bulletin from the captain was pinned to the notice boards, informing passengers a rescue was imminent -- though most of them already had sensed something unusual was afoot. As normal ship's activity gave way to excited commiserating, many gathered on the promenade deck to stand look-out. Meanwhile, the ocean grew more rambunctious. According to Maguire, "Captain Sorrell must have been very proud of his ship. I think we all were. There are about ten million rivets in her hull and most of them must have taken maximum strain in that drive into the heaving green wastes." It was after one o'clock in the morning the following day when the ship arrived at the promised time, only to find a bigger challenge awaited: how to transfer two critically injured patients from the freighter to the giant ocean liner across a heaving, foaming sea. Read tomorrow's post for the the conclusion of the Mary's daring rescue at sea.